Winning on the road in the NFL is never easy, and Sunday against the Redskins the Falcons gutted out a huge 24-17 win against a game Skins team to improve to 5-0 on the season. It’s the first time in the history of the team they are 5-0, and Sunday they leaned on a future Hall of Fame TE to help get the job done. Tony Gonzalez had a huge day receiving, catching 13 passes for 123 yards and a touchdown, while Julio Jones snagged 10 balls for 94 yards and a score. Matt Ryan threw for 345 yards, two touchdowns and one interception on 34-of-52 passing for Atlanta. The game was put away when Michael Turner rumbled in from 13 yards out for the go-ahead score to put the Falcons up for good 24-17. Atlanta got help from their D as well, as CB Dunta Robinson and safety Thomas DeCoud both had picks in the win. Turner was bottled up for most of the day, running for just 67 yards on 18 carries, but broke through for a 13-yard sprint to the end zone when it mattered most for the Falcons. 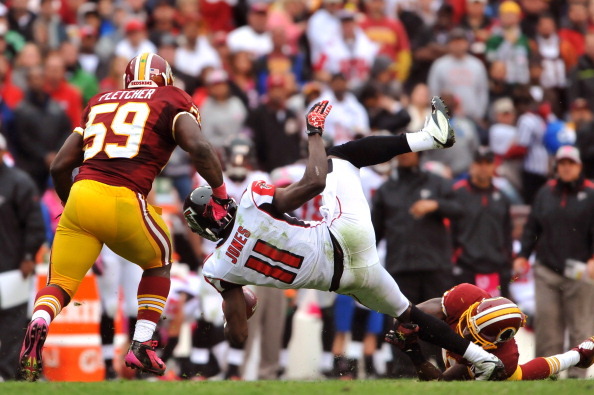 Redskins rookie QB Robert Griffin III connected on 10-of-15 passes for 91 yards, but left the game after taking a shot to the head from Falcons linebacker Sean Weatherspoon. Kirk Cousins took over under center and threw for 111 yards, one score and two interceptions on 5-of-9 passing for Washington (2-3), which lost at home for the eighth consecutive game. Washington RB Alfred Morris ran for 115 yards on 18 carries for the Redskins, while Santana Moss caught two passes for 80 yards and a touchdown in the setback. With the game tied at 17-17 and 5:40 left on the clock, the Falcons began their decisive drive on their own 31. Facing 2nd-and-9 from near midfield, Ryan stepped up in the pocket and hit Jones deep down the left sideline for 29 yards to the Washington 22. Two plays later, Turner went off left guard for the 13-yard touchdown run, putting the Falcons ahead for good. 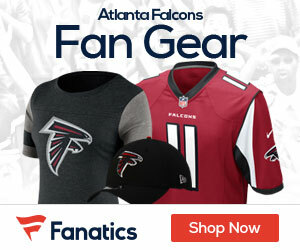 Next week the Falcons play host to the Oakland Raiders at the Georgia Dome.